Song: "Shake Your Sillies Out" by Raffi from the album More Singable Songs - I will start each storytime with this song to get the kids' jiggles out and to signify that now it's time to start listening. Memory Box: This week's Memory Box item was a hopscotch board from the book Little Pea by Amy Kraus Rosenthal. 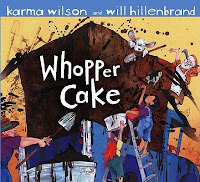 Book: Whopper Cake by Karma Wilson. This story might be a little long for a jumpy group, but I so love Karma Wilson's rhymes. Grandpa wants to bake Grandma a birthday cake, and his motto is "Go big or go home", so his cake turns into a gigantic "Whopper Cake." 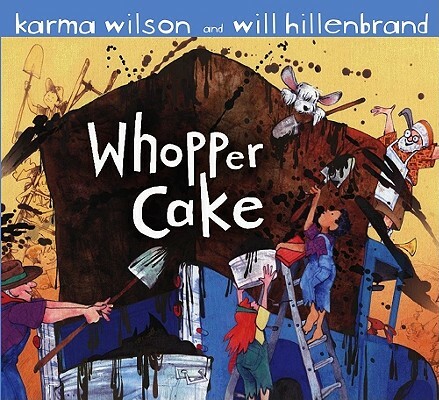 Wilson uses rich vocabulary ("traumatize", "oar", "whopper") throughout and includes a recipe at the end of the book. Flannel Board Story: The Cake That Mack Ate by Rose Robart. I'm not showing you a picture because our felt pieces are pretty old and not the most beautiful. This cumulative story makes a great flannel story. When I place the pieces on the board, I place them in a circle, placing Mack (the dog) in the middle as the last piece. After I've put several pieces up, I invite the kids to fill in the words for me as I point to each piece. Rhyme: I made up a "Five Little Candies" rhyme and a prop to go with it! Five little candies on the shelf at the store. CRUNCH [I act like I'm eating one and then put it behind the felt board]... and then there were four. Four little candies, sweet as could be. CRUNCH... and then there were three. Three little candies, red, pink, and blue. CRUNCH... and then there were two. Two little candies, melting in the sun. CRUNCH... and then there was one. One little candy, looking so yummy. CRUNCH... they're all in my tummy! Book: Little Pea by Amy Kraus Rosenthal. This is the story of Little Pea, who liked many things, but hated one thing: candy. See, candy is what peas have to eat for dinner, so his parents make him eat five pieces before he can have his dessert - a big bowl of spinach! Although the format's a little small for storytime, I just love this cute, cute story! Song: "Head Shoulders Knees and Toes" - I explained to the kids that when we eat cake and cookies and candy, we need to do some extra exercise to make sure we stay healthy! I always do "Head Shoulders Knees and Toes" slowly the first time and then repeat it faster and faster for as long as the kids find it fun. Put your hands on your... head! Put your hands on your... shoulders! Put your hands on your... tummy! And when we put our hands on our tummy, let's play it like a drum. Put your hands on your... knees! Put your hands on your... toes! And you're so close to the ground, sit down and have a seat. Felt Board Activity: Gummy Bear Colors. Our Miss T does a "Toddler Time" program and she always has felt items in different colors that go along with her theme. She passes them out, one to each kid, and when she calls their color, the kids who have that color bring up their felt piece and put it on the board. This is a simple activity that is infinitely flexible and encourages kids to move around and to approach the felt board. Miss T had done bears as a theme and so I used her colorful bears as "gummy bears". Take-Home Craft: Gum Ball Machines. (Inspired by this post at the Frugal Family Fun Blog!) We had the blue circles and orange triangles left over from previous crafts. I ordered Avery color coding dots and cut up tin foil pieces for them to use. Last fall, we started doing take-home crafts instead of doing a craft at the end of the program. We put together a packet for each child with the supplies they will need (not including things like scissors, glue, crayons, etc.). I wasn't sure how parents would react - our library had been doing in-house crafts at storytime for 20+ years - but people seem to really like it. It's easier for staff because we don't have to constantly set up and take down all the craft tables and because we don't have to try to instruct patrons as 20 kids are running around the room. Our feedback from parents has been positive. They like having something to do to at home to extend what we talked about in storytime and to share with dad or grandparents who might not have been able to attend storytime with us. Another thing I love about doing take-home packets is that we can include information about early literacy. I create a handout for each week of storytime with a related book list and some ideas for encouraging early literacy at home. I can also include schedules for upcoming parent programs, book marks, or whatever we want parents to take home. By including it with the craft pieces, I am hopeful that the papers actually make it home and hopefully to the fridge or somewhere where parents will read them! What other sweet books or songs would you add?